Two guayaberas seen from the back, showing the alforza pleats and the Western-style yoke. The guayabera (/ɡwaɪ.əˈbɛrə/) is a men's shirt typically distinguished by two vertical rows of closely sewn pleats that run the length of the front and back of the shirt. The shirt is typically worn untucked. Guayaberas are popular in the Caribbean region of Colombia, Mexico, Ecuador, Venezuela, Central America, the Caribbean, Southeast Asia, and throughout Africa. It is also known as a "Wedding Shirt". The origin of the garment is something of a mystery, thought to be the result of a mixture of Native American and Spanish styles, developed in the late 18th or early 19th centuries. Various claims for the distinctive style have been made, from Mexico to other Latin American countries to the Philippines. A version of the shirt's origins claims that Mexicans originated it in either the state of Veracruz or the Yucatán Peninsula. One theory holds that it was during the era of trade routes through the Caribbean that the Mexican shirts got to Cuba and were taken to the Philippines by the Spaniards, where the evolution of the intricate embroidery started. Alternatively, others speculate that the shirt, which has documented origins in the Philippines prior to the arrival of the Spanish, made its way to Cuba through Mexico via the Manila-Acapulco galleon trade. The origin of the Guayabera shirt remains a mystery, and a similar prototypical shirt has existed since the 18th century, probably imported from Spain. Guayabera may come from a Cuban legend that tells of a poor countryside seamstress sewing large patch-pockets onto her husband's shirts for carrying guava (guayabas) from the field. Guayabera may also have originated from the word yayabero, the singular nickname for those who lived near the Yayabo River in Cuba. Others claim the origin to be from Baní, Dominican Republic, also for the harvesting of guayaba fruit in the region. This theory explains the movement to Cuba, through Máximo Gómez, which used this type of shirt. Closeup of a pocket on a Cuban guayabera, showing the button and aligned alforzas. Either two or four patch pockets and two vertical rows of alforzas (fine, tiny pleats, usually ten, sewed closely together) run along the front and back of the shirt. The pockets are separately detailed with identical alforzas that are aligned with the alforzas on the body of the shirt. The top of each pocket is usually adorned with a matching shirt button, as are the bottoms of the alforza pleats. Vertical rows of adjusting buttons are often seen, one on each side, at the bottom hem. While most versions of the design have no placket covering the buttons, a few newer designs do. The bottom of many shirts has slits on either side, and these include adjusting buttons. The bottom has a straight hem, and is not tucked into the trousers. Mexican guayaberas often use complicated embroidery in place of or as a supplement to the traditional alforzas. This style originated in Mérida, Mexico. 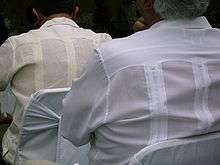 The simpler shirt-jac (short sleeve) has been worn in the past by English-speaking Caribbean politicians and office workers as formal attire due to the heat. In Zimbabwe, the short sleeved version may be worn for special occasions, such as weddings and funerals. US Secretary of State John Kerry and Colombian President Juan Manuel Santos wear guayaberas while discussing an upcoming peace treaty. Guayaberas have been worn extensively by a number of Latin American political leaders, including César Chávez, Carlos Prío Socarrás, and Fidel Castro. This is often interpreted as a sign of the wearer's affiliation with populist political positions. U.S. presidents, including Ronald Reagan and George H.W. Bush, have also worn the shirts as a sign of solidarity when visiting the Cuban community in Miami, and presidential candidates have been given the shirts by local political leaders. In the Dominican Republic it is known as "chacabana". 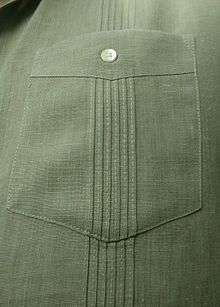 In the Guyana, Trinidad, and the United States a type of guayabera, some with pleats and pockets or (plain with pockets - similar to a safari shirt) is sometimes called a "shirt-jac". In Jamaica it is known as a bush jacket. In the Mexican state of Yucatán, it is also known as camisa de Yucatán. The Philippines' national costume for men, the Barong Tagalog shirt, has some features which are similar to the guayabera. However, the Barong Tagalog is a much more formal piece of clothing. It lacks pleats or pockets, and is marked by intricate, hand-sewn embroidery in a variety of forms, including geometric or floral patterns. It is not traditionally made of linen, but rather of hand-woven, fine, translucent piña or jusi fiber. Less formal linen and cotton variants of the barong are used in everyday wear, as school or office uniforms for instance. A disputed theory is that the Barong Tagalog was either a local adaptation or a precursor to the guayabera. According to those who claim that the barong is the precursor of the guayabera, the guayabera shirt was originally called the "Filipina" since Manila-Acapulco Galleons brought the shirt to Mexico from the Philippines. In the Samoan islands the shirt style has been introduced into the masculine formal attire known as the "safari set". American Samoa's version of the shirt often includes tightly-sewn vertical pleats and two or four buttoned pockets. 1 2 "Guayabera: The Mexican Chapter". The Guayabera: A Shirt's Story. HistoryMiami. Retrieved 2015-04-10. 1 2 3 4 5 Armario, Christine (30 June 2004). "Guayabera's Origin Remains a Puzzle". Miami Herald. Retrieved 10 April 2015. ↑ "Interesting Facts & Information: tourism, travel, culture, language, business, people. » Blog Archive » Cuban Traditional Clothes". Kwintessential.co.uk. 2010-03-29. 1 2 "The guayabera: Traditional tropical shirt finds new customers online". ↑ "Cuban Guayaberas Make Mark Abroad". ↑ "Cool comfort: The guayabera born of necessity, but still a fashion statement". 1 2 "Guayaberas:Fashion Statement for Men". ↑ "Guayabera shirt now official Cuban formal dress code". BBC News. 2010-10-07. Retrieved 2012-04-09. ↑ "The Linen Guayabera: Traditional Wedding Attire or High Fashion Wedding Attire". ↑ Root, Regina A. (2005-06-04). Latin American Fashion Reader. Bloomsbury Academic. ISBN 9781859738931. Retrieved 2015-04-10. ↑ "Best Place to Buy a Shirt and Chat with a Legend (2002): La Casa de las Guayaberas". Miami New Times. Retrieved 2015-04-10. ↑ "After debate, Trump visits with the Hispanics who seem to like him most". Miami Herald. 2016-09-27. Retrieved 2016-09-27.